DES MOINES – The Iowa Barnstormers have signed offensive lineman Quante Hines to the 2019 roster, Head Coach Dixie Wooten announced today. 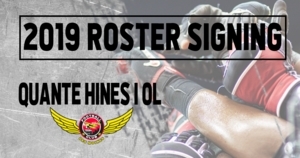 Hines (6-0, 325, Bluefield College) joins the Iowa Barnstormers for his first season in the Indoor Football League (IFL). Collegiately, Hines played at Bluefield College for four years at both Center and Guard. While playing with the Rams, Hines racked up several honors including First Team All Mid-South Conference, First Team All-American, and First Team NCCAA (National Christian College Athletic Association).